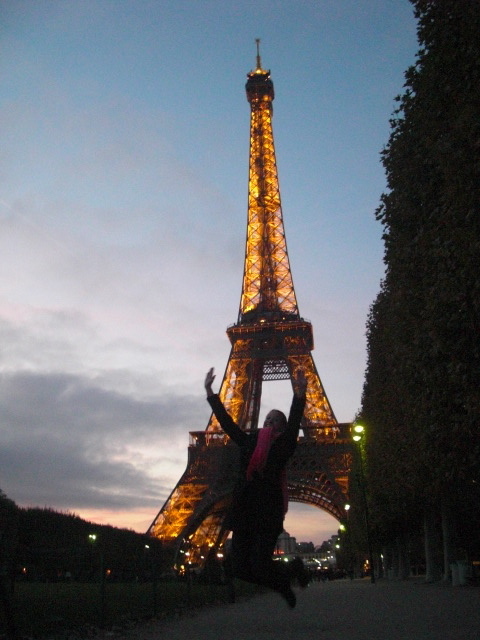 Ahhhhh Paris….what an amazing weekend!! I LOVE PARIS. Because of the grève, we had to leave Wednesday instead of Thursday, which was completely okay with me – that meant a whole extra day for sightseeing! We left Wednesday shortly after lunch – and got onto our train without problem. The train ride lasted about 5 hours – pretty nice that you can get from Cannes to Paris in 5 hours or less. We arrived in the evening, and just checked into our hotel and called it an early night so we would be ready for the next day full of touring. We woke up for breakfast at 8am so we could start our tour at 9am – and the breakfast was included in the hotel. Each morning, we would have a half a baguette (perfect – crunchy on the outside, light and fluffy on the inside) with butter, jam, cheese and nutella…along with some fruit, orange juice, and your choice of tea, coffee or hot chocolate. It was delicious and a great way to start the day. Next, we started our Revolutionary tour – for our class on the French Revolution, we played a game in class where we each assumed a historical figure. For our tour of Paris, we had to choose a site that was significant to the French Revolution and also to our historical character, and then present the site and explain the significance. 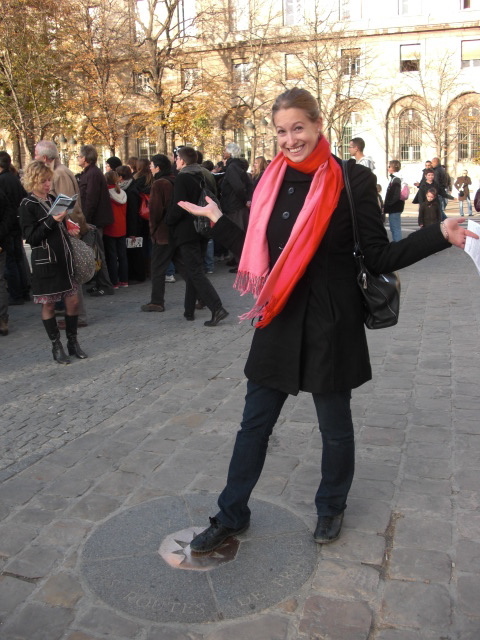 We had about 10 sites to get to, all spread throughout Paris, and Beth had budgeted this tour to take 3 hours. 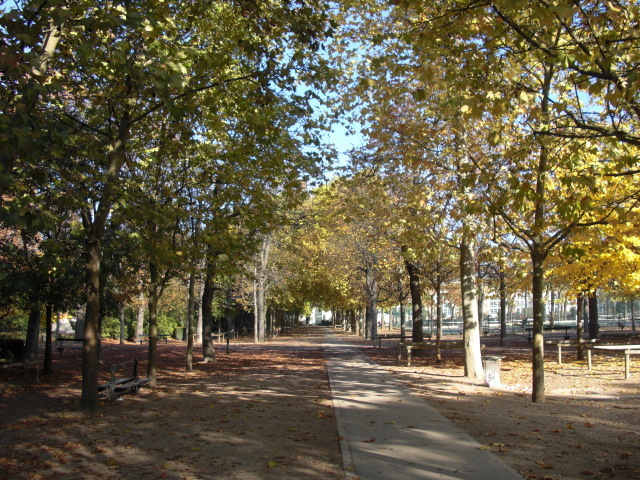 Some of the places included the astille, the Champ-de-Mars, the Tuileries, Place de la Concord, the Palais Royal, and more. 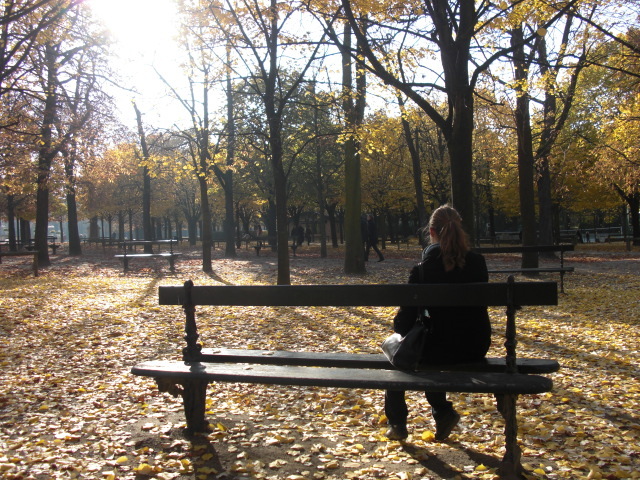 Some sights don’t exist today (like the Bastille and Tuileries), but the important thing is to be at the spot. Instead of 3 hours…it took 6! I don’t think Beth took into account the actual distance between sights and how long it takes to walk that far…in addition to moving along a group of 10 people, some of whom walk very slowly. It took us 1.5 hours to cover the first 2-3 sights! Beth outlawed stopping to take pictures and made us keep walking at a good clip. By noon, we had to stop and get lunch and then Beth conceded to taking a bus a few times. By the second half of the tour, everyone was really sick of it and was getting really annoyed and ready to be done. It would have been a good tour if it would have been more condensed. 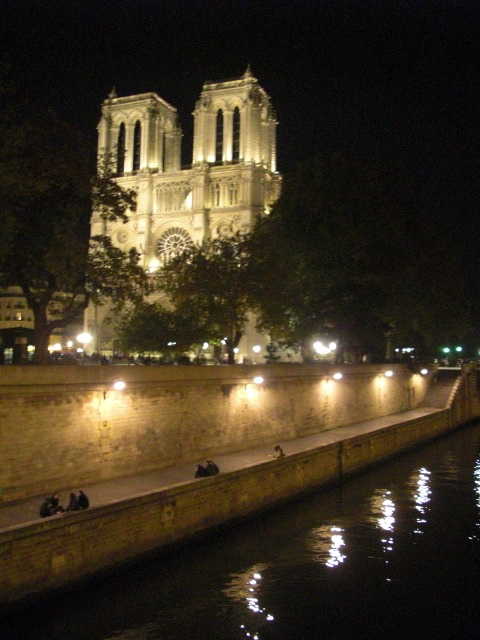 It ended at Notre Dame, and I wanted to just stay there but we had to return to the hotel room quickly – luckily it wasn’t too far from Notre Dame. Leah, Laura and I headed back to Notre Dame right away so we could tour that before we were going to meet some others at the Eiffel Tower. Notre Dame was great! Luckily, there wasn’t much of a line so we got in right away. It was so cool to be there – I grabbed their claendar in case we would be able to come back for Mass or vespers sometime over the weekend. We took pictures outside at point zero – all distances in Paris are measured from there and it’s right outside Notre Dame. Also, if you touch point zero, you will return to Paris :) I thought it was funny that in front of this super famous old church there are a ton of dancers, jugglers, musicians, flame throwers – all sorts of stuff! Touring Notre Dame didn’t take as long as we thought, and we still had quite a bit of time before we had to be at the Eiffel Tower, so we decided to try to get into Sainte-Chapelle, which was close by. Point Zero! I guess that means I'll be coming back to Paris - thank goodness! 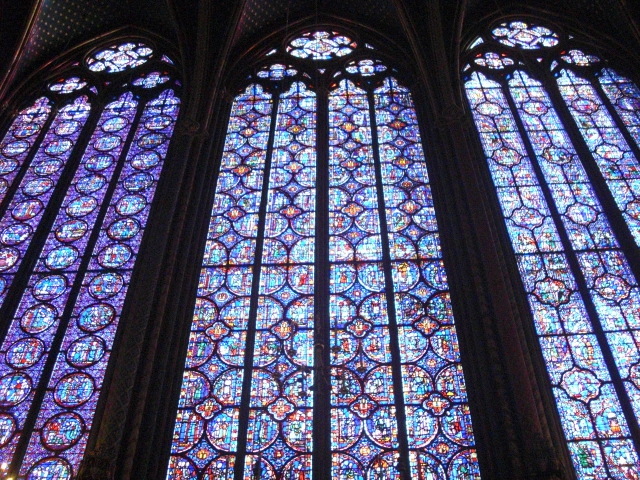 It was getting close to closing time, and Sainte-Chapelle is known for having long lines, especially on sunny days, because it is famous for its unrivaled stained glass. We hopped in line and only waited about 15 minutes! Sweet. We got in and immediately went to the Chapelle Haute – which is where the amazing stained glass is – and it is so beautiful! The altar area is undergoing restoration, so we didn’t get the full effect, but it was still amazing. 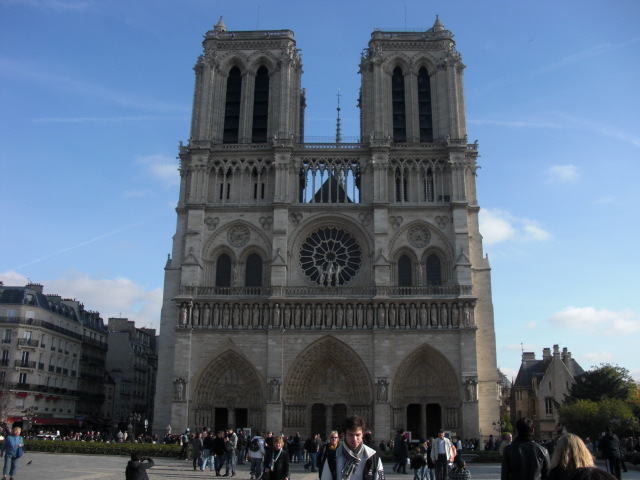 The whole chapel was built in only 6 years (while it took 200 years to build Notre Dame). 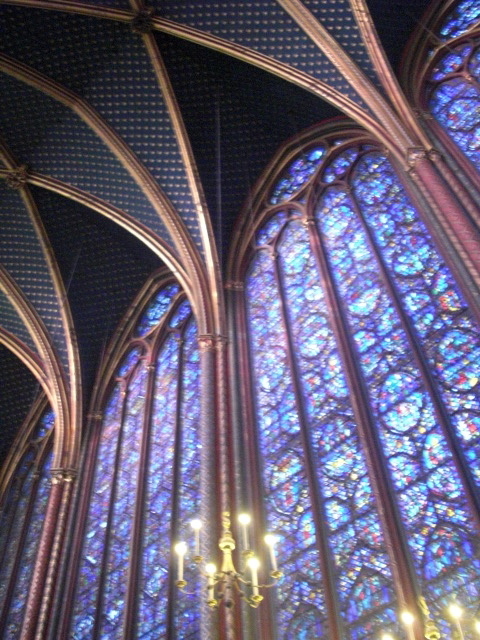 It was built to hold the supposed Crown of Thorns – the King Louis IX paid 3 times as much for the Crown than for the building of Sainte-Chapelle! There are 15 windows of stained glass that tell over 1,000 stories from the Bible – from Genesis to Jesus’ crucifixion. Today, Notre Dame has the Crown of Thorns (and it’s only shown on Good Friday and the first Friday of the month). I made sure to buy some postcards on the way out that show the full effect of all the windows. 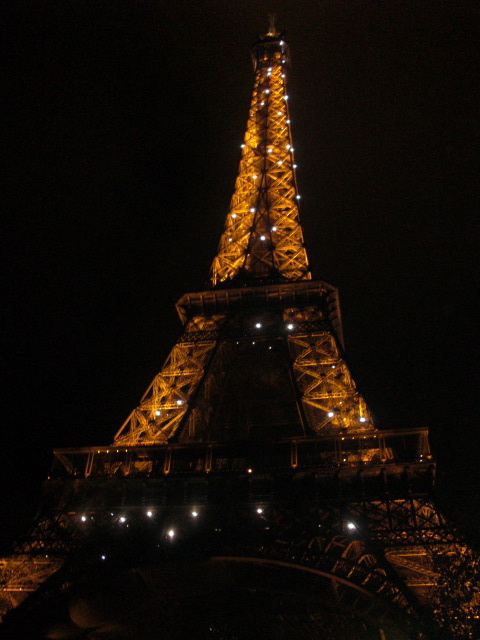 Then it was time to go to the Tour Eiffel! We decided to walk – not the best idea! We definitely should have taken the metro, but we hadn’t taken it before and decided we would see more by walking (which we did) but the soreness was starting to set in, as we had been walking for about 10 hours straight at this point). We made it to the tower a little after 7pm – just as the sun was setting. As we walked up to it, it lit up! It was so pretty. La Tour Eiffel is just massive, and it seems to take forever to actually get to it – becoming monstruously kind of scary big the closer you get. We didn’t find our friends there, and didn’t want to spend too much time looking since we were so excited to go up the tower. We figured they might have gone up already since we were late, and we hopped in the line for the stairs. Taking the stairs is much faster and cheaper – though it was a lot of work, the views were gorgeous!!! You can see the whole city, and it was amazing to see La Ville Lumière all lit up. What an experience. Pictures didn’t turn out well – so I took videos instead. We went all the way to the top (900 feet in the air!) and it was really windy and cold, so I was glad I was wearing my winter coat. Leah was only wearing a sweater, so we just snapped a few pics and took a quick tour around the top before hopping in the long line to go back down the elevator. We were so exhausted at this point – 12 hours of walking catches up to you. We got off the tower and headed to the closest intersection and hobbled into a pizza/pasta place. I had some great spaghetti carbonara and then we metro-ed it back to the hotel, where I feel asleep before my head even hit the pillow. The next morning, I woke up and was definitely feeling the soreness from the day before. My knees felt really sore (and just started to recover today). Pretty much everyone was going to Montmarte/Sacre Coeur, which was not on my list of must-see’s, so I originally wasn’t going to go, but I didn’t want to spend all day by myself, and Leah and I had some common sights to see afterward. So, after breakfast we set off in a big group toward the metro. We reached Montmarte and first saw the Moulin Rouge! We took a few pics and walked to Sacre Coeur. 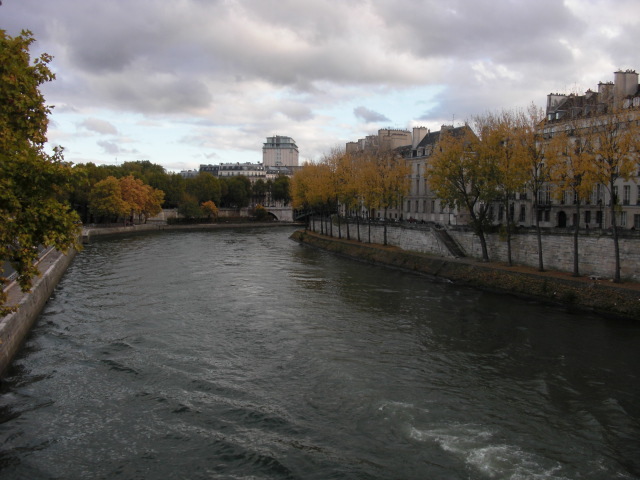 That area of town was quieter – I prefer the area close to the Seine; more touristy, but the Seine is so pretty and everything is lively there. Sacre Coeur was huge – and had some great views of the city from there on the hill. We couldn’t take pictures inside, so I bought a postcard instead. It was a pretty quick walk through. Des billets gratuits! Free tickets! 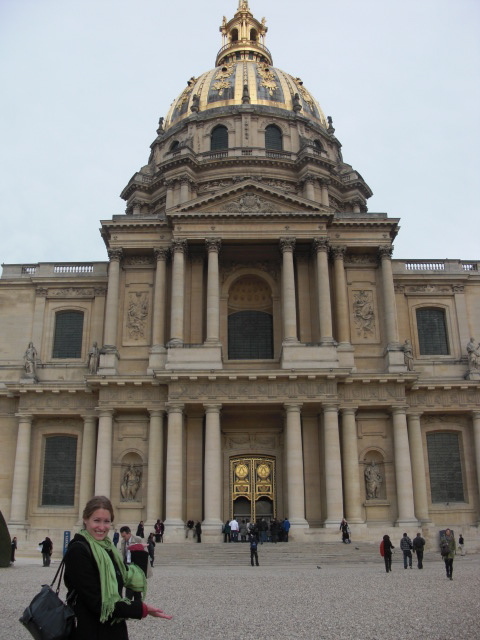 After Sacre Coeur, Leah, Laura and I headed to the Musée de l’Armée, a military museum and has Napoleon’s tomb. We actually got in for free! Museums have a student rate and a student of the E.U. rate. Since we have long-term visas and now live in France, we are technically students of the E.U. 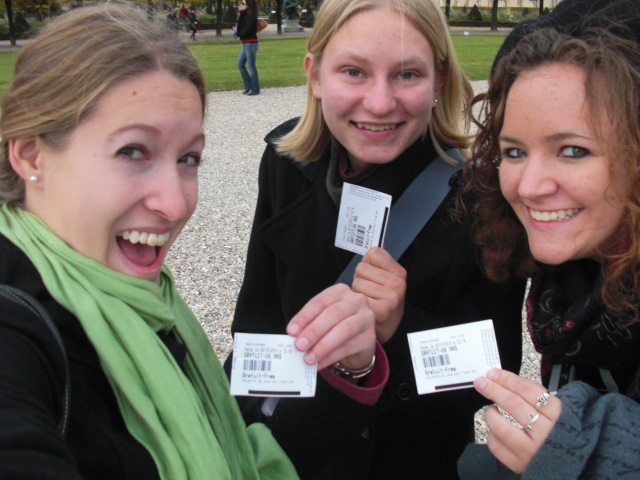 – and we got in for free at every museum we visited! The area that holds Napoleon’s tomb is very elaborate and ornate – 26 lbs of gold on the ceiling! 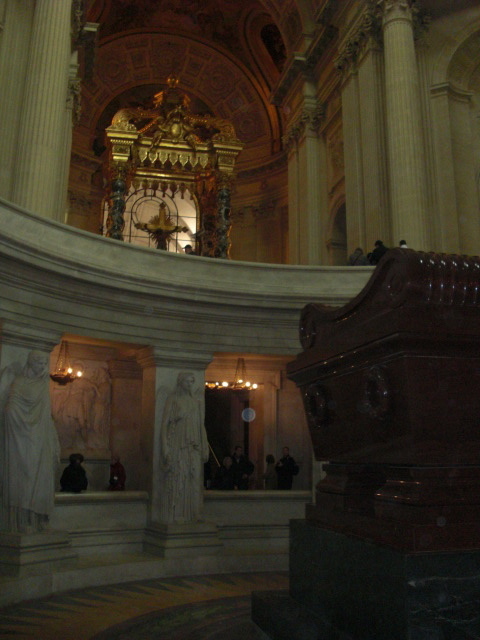 His tomb is surrounded by French war heroes, and he is inside 6 coffins! A little excessive. His tomb is surrounded by statues – each representing one of his military victories. What an ego. We also passed through some of the exhibits – including the Revolution through Napoleon, WWI, and WWII. We saw some of the uniforms of the National Guard which was really cool to see because that actually means something to me now that I have been studying the French Revolution. There was so much information in each of the exhibits – too much information for us exhausted tourists to take in, so we just wandered through looking at stuff. At the end of the exhibit, I said Bonjour to the guard as he was saying Au Revoir to me, and we had a little conversation. He asked if I was Canadian – which is cool because that means he thought I actually speak French! (well I do…but not fluently yet!) What a good compliment – I love being complimented on my French, it means I’m making progress! We decided to go to the Musée Rodin next since it was right next to the Musée de l’Armée. 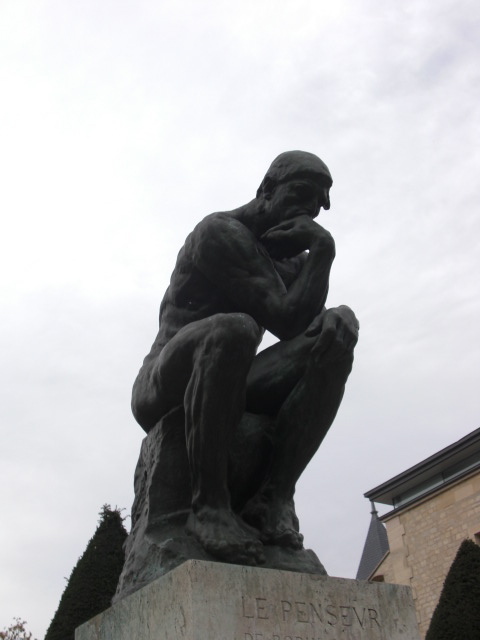 Rodin is a really famous sculptor – right up there after Michelangelo. I loved this museum – when it comes to art, I much prefer sculpture or photography. There was also a lovely garden there, even with lounge chairs so we got to put up our feet and rest a little while – which was fabulous and very necessary! We relaxed in the garden and looked at some more sculptures before heading off to meet the group at the Louvre. We were a little late because we walked and were still really sore, but it was all fine. I had no idea that the giant glass pyramid is actually the main entrance to the museum – cool! The Louvre is MASSIVE – and really overwhelming. I was surprised by the diversity of their exhibits – there is just SO MUCH STUFF there. 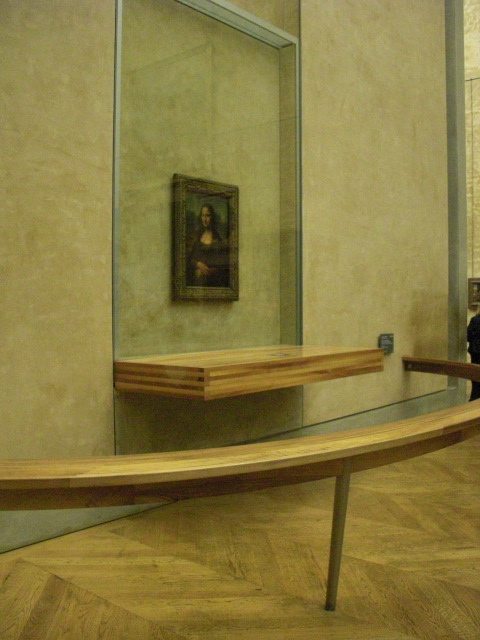 I headed up to see the Mona Lisa right away – and it’s true what I’ve heard. It’s a bit underwhelming. It’s small, behind a pane of glass, and surrounded by huge crowds. I also went to see the Venus de Milo, and then wandered through the Egyptian and Oriental exhibits, since I found those much more interesting. I even stopped at the café there for a little while because I was so hungry I was not going to make it til dinner. We went to dinner back in the Latin Quarter, nearby our hotel and I had a great dinner of salmon with crème brulée for dessert – delicious! And again, fell asleep immediately. The next day we had all day free and we split up for the day because we each had different things we wanted to see. Laura decided to come along with me for the morning – and we started at the Deportation Memorial. It’s a memorial to the 200,000 French people deported to work/death camps, who did not return. The memorial is very well done – it was created to somewhat represent the environment the deportees were in with really tall walls, small spaces, and dim lighting. The memorial has 200,000 crystals to represent each deportee who did not return (overall, less than 3% did). There were a lot of good quotes there, the eternal flame of hope, and the Holocaust reminder: Pardonne, n’oublie pas. Forgive, but do not forget. 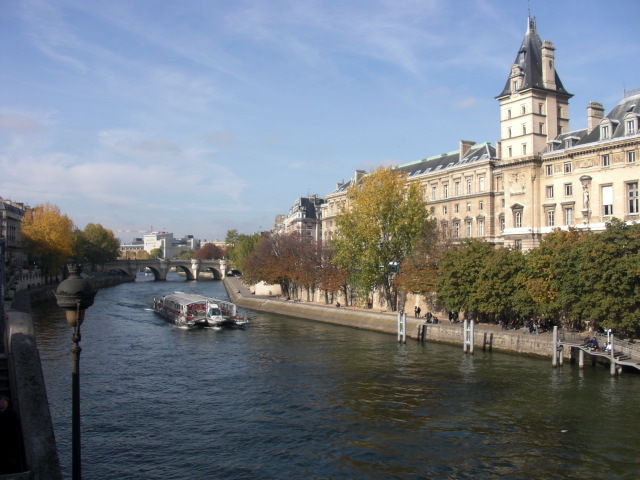 From there, we walked to the Musée d’Orsay – Laura really wanted to go. I was indifferent, but wanted to go more to say I’ve been there, and to see some of the really famous paintings. We waited in line for 30-45 mins, but got in free! Laura went nuts flitting from exhibit to exhibit. I saw some of the more famous paintings, and then sat down for about 40 minutes because I was already feeling exhausted. 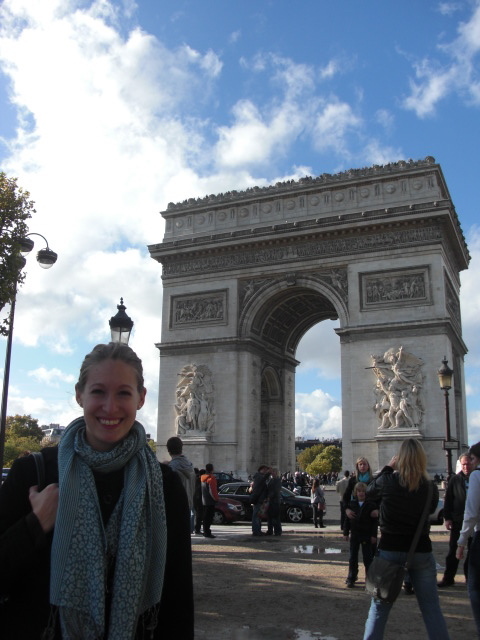 After the Orsay, we walked to the Arc de Triomphe. The Champs-Élysées was really crowded, and the Arc de Triomphe was huge! It’s really detailed and decorated. It took a while to figure out how to actually get to it, since there are no crosswalks to cross the giant roundabout circling it. We realized there’s an underpass to get there. We paid our respects to the unknown soldier and took some pictures. Then we split up – Laura wanted to see another Monet exhibit, and I wanted to see the Musée Carnavalet – a museum of Paris’ history. I took the hotel room key with me and metro-ed it to Carnavalet. It’s housed in an old hotel – really pretty with the ivy climbing the walls. I walked through the exhibit until I reached the Revolution period. Some of the Revolutionary stuff was cool – it was mostly knick knack-y stuff but it’s cool that it all means something to me now. I saw stuff like a replica Bastille made from real stones from the Bastille, Robespierre’s membership card to the Jacobin club, some of Robespierre’s hair that was cut off his decapitated head, a child’s guillotine toy, etc. 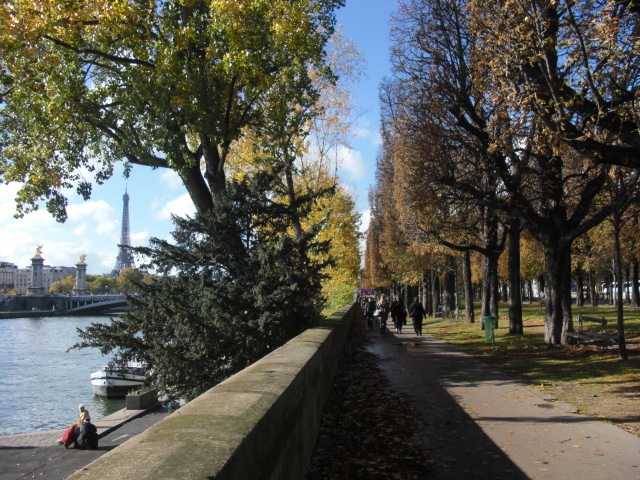 I decided to walk back to the hotel to lie down before our Bateaux Mouches river boat tour down the Seine – I was so tired. I got back to the room and thought, I should get my alarm clock….but it was so far away and I was so comfortable…I conked out. And startled awake at 6:40pm – and we were supposed to meet at 6:45pm! AGH! I grabbed my stuff and ran off to the metro – but unfortunately the stop I needed did not connect well at all. 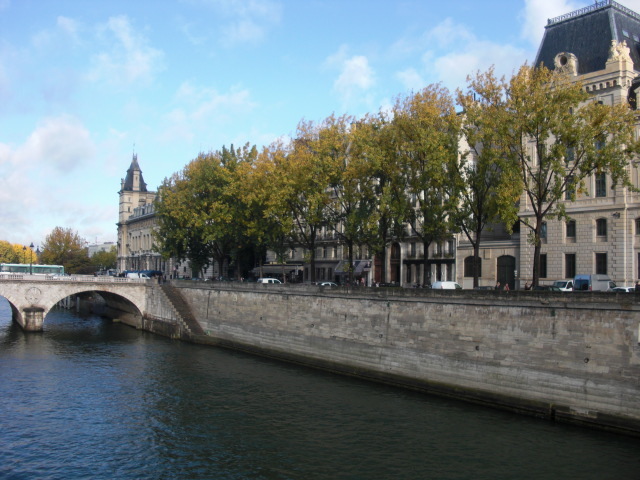 I just decided to get off at Assemblée Nationale and walk – and I didn’t make it to the Bateaux Mouches until 7:15pm. They would all be on the boat by then, so I went there just in case, but didn’t see anyone. I checked with the ticket counter to see when they would return – 8:10pm – and I could go to dinner with all of them. I was a little upset at first about being late and missing it, but I got over it quickly by telling myself – hey, I’m still in Paris and I’ll have a good night. And if I don’t find them, I’ll have dinner on my own just fine. So, to wait until 8:10, I crossed the street and bout a Nouvel Obs (a magazine) and looked for a cafe to get some tea. I stopped at a place and told them I would sit outside and wanted some tea. I read some of my magazine, but 15-20 minutes later, I was still waiting for my tea. Seriously? It’s just some hot water and a tea bag. It was about 8:05 by then, so I just got up and left. I didn’t see anyone getting off the boat that pulled up, so it was time to continue on my own. 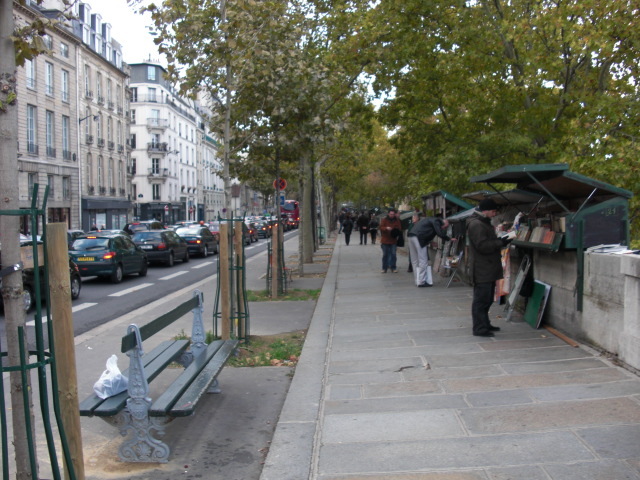 I took the metro back to the Latin Quarter and to find some dinner there – there are tons of restaurants to choose from. I found a cute little hole-in-the-wall traditional French cuisine place. I got some good people watching in eating by myself and spoke French with the staff. I had onion soup, lamb with fries, and apple pie with ice cream for dessert – all for 12.5 euros! Gotta love the menus – the fixed formula where you choose your 3 course meal between a set of entrées, a set of plats, and a set of desserts – all for a fixed price. From there I just walked back to the hotel, and after talking with Leah discovered that I had just missed them at the Bateaux Mouches! Turns out they didn’t make it onto the 7pm boat, but the 7:30 one instead. But it was still a really good night – the part that made it so good was knowing that I can navigate Paris totally on my own – I love having that kind of independence. The next day, we accidentally got to breakfast an hour early. Daylight savings time happened and we forgot to set back our clocks! The hotel even had put up a sign reminding us which I saw, but forgot about it by the time I got upstairs. 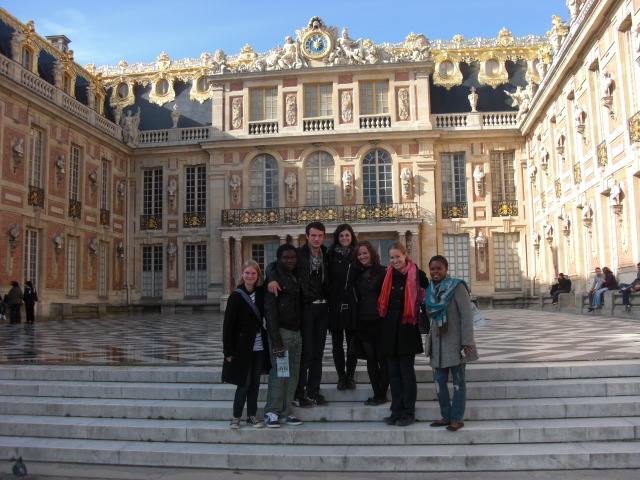 We got to sleep a little more before we all had to leave for Versailles though. 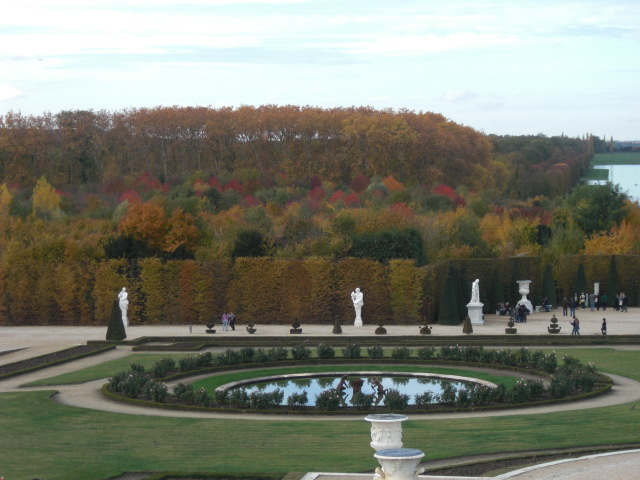 We took a train to Versailles – took about 30 minutes. 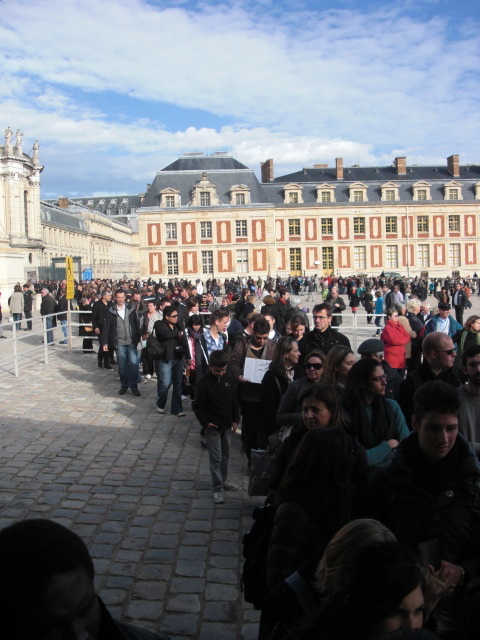 We got to the Chateau, and the lines were ridiculous. We had to wait in line for tickets first, and then in a different longer line to get into the Palace. 2 hours of waiting – UGH. We finally got inside – and it was beautiful in the fact that everything was so elaborate and over the top gaudy that it was actually pretty. 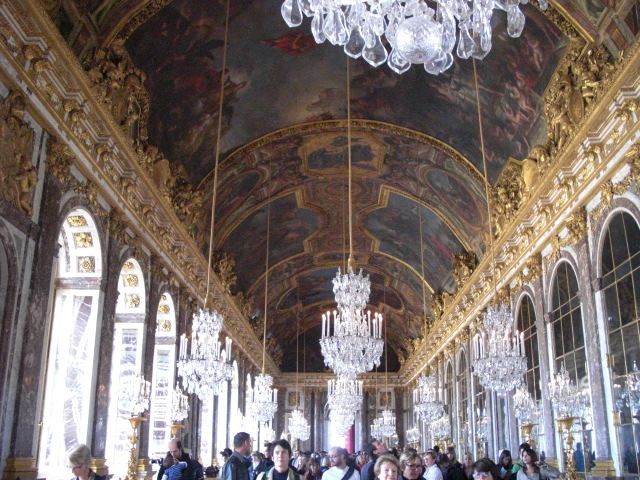 I liked Versailles, but also hated it – it was ruined by wall-to-wall crowds, long lines, and a really out of place art exhibit. 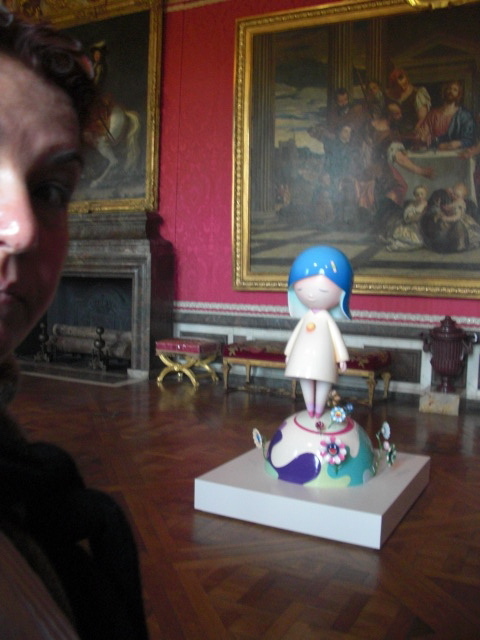 I have no idea why they agreed to show plastic bright colored cartoonish Japanese art in a French palace – why would you do that to Versailles?? It ruined the ambiance. We also had to wait in line to get into the garden, since we happend to come on a day they were playing music in the gardens. It was a pain, but the music was nice, and the gardens were beautiful! We were more than ready to leave by 2pm – so we took the train back, and had a late lunch/early dinner at an Indian restaurant. It was really good – and made me really excited for India. 2 months from now, I will be there! YAY! One of the Japanese art pieces...see what I mean? Leah and I had decided we wanted to go to vespers at Notre Dame, and Laura decided to come along. We perused souvenir shops until it was time. We made it to vespers just in time. We were a little worried because they were using incense, and Leah’s allergic to it! Luckily, Notre Dame is so big it just dispersed. The organ was amazing and we all definitely wanted to stay for Mass afterward. 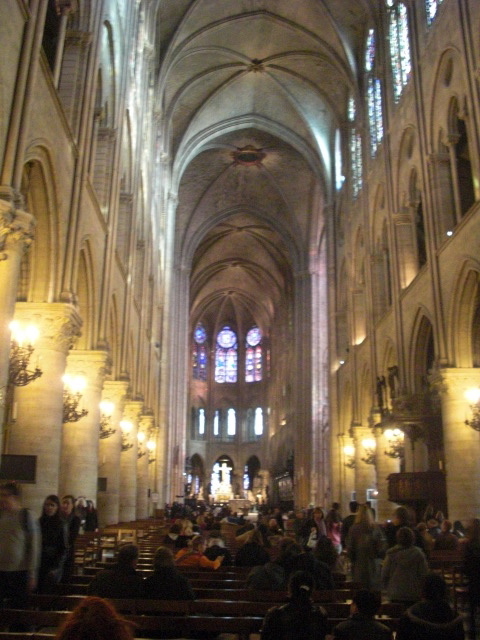 The whole time I just couldn’t believe I was actually in Notre Dame for Mass – it was awesome. Mass was said by a cardinal too – I think that’s the highest “ranking” officiant I’ve had Mass with. Mass was in French – and I understood it all. It was an incredible experience. We walked around the outside taking pictures, and were going to go see the Arc de Triomphe and Champs-Élysées all lit up at night, but Leah was kind of high from the incense, so we just got a crêpe (pour moi, avec confiture – with jam) and called it an early night. After that we had to leave Paris :( Cannes is so lame compared to Paris! We made it to the train without problem and made it back just fine – save for the fact that the train ahead of us hit a wild pig! I didn’t know there were wild pigs in France. We had to re-route and were delayed about 45 mins. What an incredible weekend – I saw SO MUCH for 4.5 days: Notre Dame, Sainte-Chapelle, Tour Eiffel, Louvre, Musée Rodin, Musée d’Orsay, Musée de l’Armée, Musée Carnavalet, Deportation Memorial, Sacre Coeur, Arc de Triomphe, Champs-Élysées, Versailles, Jardin du Luxemboug…oofta! I also learned I took 675 pictures! 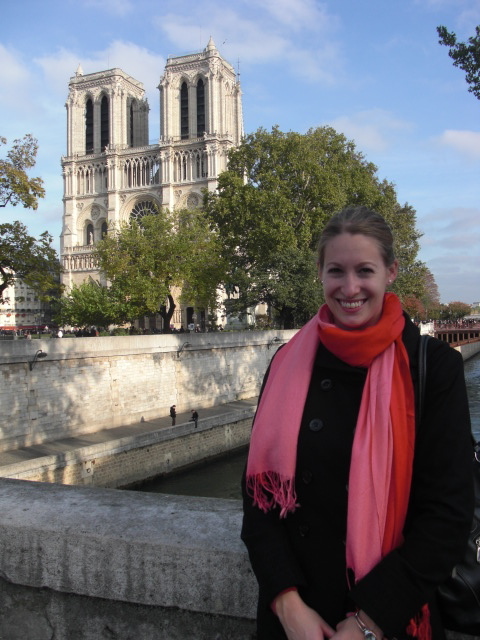 I loved Paris – and I am so glad I’ll be back there in a few weeks – Nov 20 – to show around my friend Kate, who is studying abroad in London. And now…only a few days until ROME! I’ll leave for Rome on Friday and will come back on Sunday. WOO! Loving life – I am so blessed. 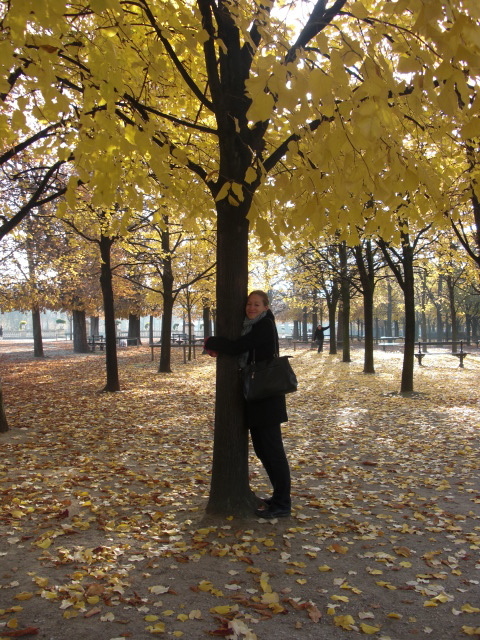 So, now we have irrefutable evidence…you are a tree hugger!